Neuro-Linguistic Programming (NLP) is a proven and potent method for transformation and change. This Certified Practitioner Training contains the latest in human change technologies that when learnt and applied now will enable you to finally see how you can improve any area of your life, accelerate your results and have the career and success you have always dreamt of having! And, there is no better organisation through which to experience that power, clarity and inspiration than Inspire & Inform and Cherry Farrow. Now’s your chance to move your learning to the next level with our world renowned FasTrack NLP Practitioner Certification Training -­ the proven way to fulfill your true potential and achieve happiness, love, freedom and all the other riches life has to offer and that on one level you believe you deserve. In just 7 days, you’ll learn the skills you need to understand the relationship between mind, body, emotions and actions. And most importantly how to use that understanding to implement change and create the life you really want. In our Accelerate Your Success 7 day program you will cover four certifications to help you transform not just your own life, but also the lives of those around you. This FasTrak Practitioner Certification Training enables you to take control of your thoughts, emotions and actions to determine your own destiny. 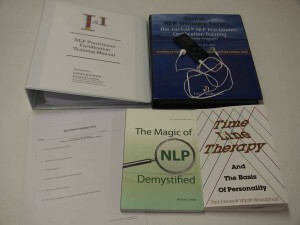 NLP Fundamentals ‐ Understand the basis and principles of NLP and understand how you learn, communicate, change and evolve. Presuppositions of NLP ‐ Empowering beliefs which will move you to action and get you unstuck. Sensory Acuity & Rapport ‐ How you can create instant liking and agreement. Representational Systems & Eye Accessing Cues ‐ Use the 5 senses to represent the information from the world. Find out how to increase creativity, flexibility and learning by using the eye patterns. Sub-modalities ‐ The secret programming software of your mind. Language Patterns ‐ The words you use show off your intellect and your personal characteristics. Use language with awareness, elegance & precision. Emotional Freedom with Stacking, Collapsing & Chain Anchoring ‐ How to control your feelings & your state of mind. strategies, the heart of NLP is all about modeling excellence. Release negative emotions like anger, sadness, fear, hurt, and guilt quickly & easily. Delete limiting decisions like “I can’t make a lot of money”, “I’m not good enough”, and any other limitations that hold you back. Professional coaching is one of the fastest growing careers in the world and coaches are in high demand. Our internationally recognized courses are designed for those who desire to become a professional coach on a full-­‐time or part-­‐time basis. Learn how the core principles of coaching are an asset for anyone in leadership roles in their homes, careers, and communities. Our innovative courses are also designed for traditional life and executive coaches who want to add state-­‐of-­‐the-­‐art coaching tools and breakthrough skills developed from NLP, Time Line Therapy®, and Hypnotherapy. Share your knowledge with friends to help them become more confident, more in control and start to create the life your really want… how would that feel? “I attended the NLP Practitioner Certification Training primarily to enhance my own skills as a Life & Success Coach. I am thrilled to say that I am more than happy with the education and skills I received and even more pleased with the personal breakthroughs I have for myself. I feel much more calm, confident and connected to my inner self and believe that I am now a more effective coach because of the breakthroughs I had during the training. I highly recommend Cherry as an inspirational & extremely talented trainer and I’m also truly grateful to her support team for all of their help and guidance through the training. 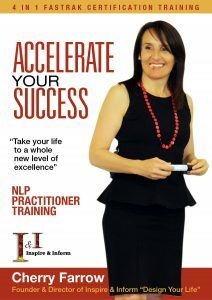 Thankyou Cherry, I’m now looking forward to Master Prac.” Toni Everard, NLP Life & Success Coach. “After our Granddaughter Chloe died tragically at the hands of my drug addicted daughter and her violent boyfriend my life seemed to spiral out of control. I began searching for more effective ways to communicate with those who had the power to make changes within the system. I responded to an advert for NLP training with Cherry Farrow from Inspire & Inform and after speaking with Cherry I was boosted by her confidence that I would be able to learn the skills I thought I needed. What I didn’t realise was that I would learn so much more! Cherry is an amazing and authentic person, she presents the course material in such a confident, self assured and inspiring way because of her own personal experiences with the power of NLP that everyone easily absorbed it and we were all able to use it effectively during and after the course. The information contained within the course is so powerful, I felt myself beginning to change, to lighten each day. My perspective of the world and the way I interacted with it started to broaden and I realised I was so much more than the story I had been consumed by. I learnt that the power of the mind is immense and each of us internally represent information differently, that information creates an emotional state within us, which directly influences our behaviour. I realised the way I was internally representing our situation was creating a never ending cycle of emotional turmoil in all our lives and I learnt how to change that. I was also able to use the tool of NLP that Cherry delivers so elegantly and effectively to conduct meetings with powerful and influential people much more effectively and even though the progress is slow, every step forward is positive and more productive. I believe that everyone would benefit from taking an NLP course with Cherry Farrow from Inspire & Inform because being able to release negative emotions from the past that bind us to old, outdated ways of thinking and bring forward the positive learnings from those events in such an empowering thing to do. The following is a list or courses & programs at Inspire & Inform assisting you to Master Excellence in Life. For details simply call our office, we would be happy to help you out. Get started straight away with this your pre‐study enrolment multi media pack, delivered to your door as soon as you register for this life changing training. This will prepare you for your course and you start learning straight away, in the car at the gym or at home. As well as the 20 CD audio collection, it includes a host of other material to stimulate and motivate you, so when you come along to our ‘live’, hands-­on training sessions you’ll already be fully primed to succeed. WHAT QUALIFICATION WILL I OBTAIN WHEN I GRADUATE? Download the Accelerate Your Success PDF. Q: I don’t want to be a ‘Practitioner’ is this course still for me? Yes, it is. The only difference is, if you want to be certified as a Practitioner, to be able to work with and help others, you need to satisfactorily complete an open book test. Enrol Now with Inspire & Inform and take your life to a whole new level of excellence! Inspire & Inform is highly acclaimed and renowned in NLP Certification. Leadership and Communication Trainings and offers the most competitive pricing in Australia for full Residential Trainings. Residential Training means that you will be staying in a residence (venue) on Yorke Peninsula during the course. You will be away from outside distractions and this helps you to concentrate more on learning, on absorbing more information and maximising your study, while at the same time giving yourself time to relax and enjoy the idyllic location. 4 Internationally recognised certificates and the ideal option of a Residential Training Environment helping you concentrate, absorb more information and maximise your learning. Sometimes, the best way to learn is simply to get away from it all – giving you the space and time to really focus on your training in depth. Contact us if you would like to chat about payment plan options.